Framec has been at the forefront of refrigeration design since 1950. Their passion for innovation, commitment to the environment and focus on food safety translates across their entire range. 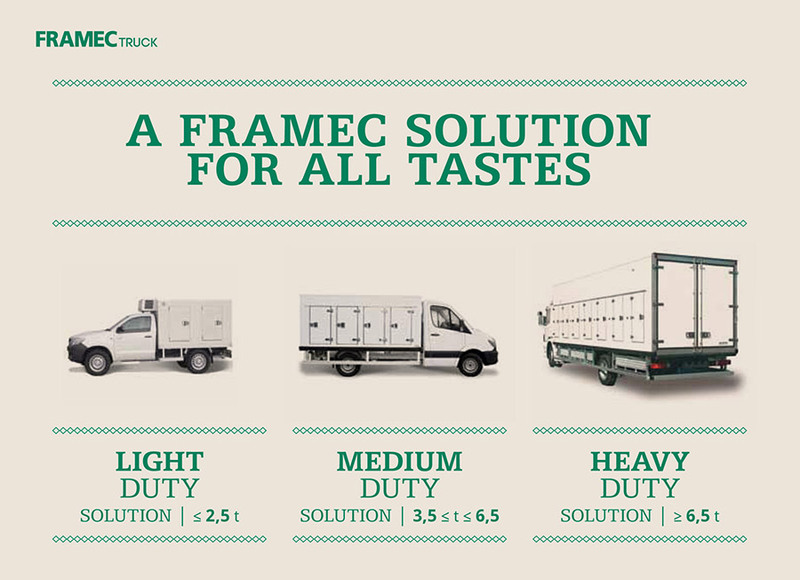 Framec’s refrigerated truck bodies are high quality, reliable and energy efficient. Their highly sophisticated trucks deliver on performance too, with modern eutectic technology on board, reducing ‘cold loss’ and subsequent usage costs. Framec’s range is broad, accommodating all truck brands and models, with their standard truck bodies customisable to your needs. Dimensions range from 2 metres body length suitable for urban transport, up to a maximum of 9 metres for transporting large quantities across long distances. Designed with multiple side doors to allow easy access to all on-board products without compromising cold retention, Framec trucks are also equipped with a rear door to easily load products with pallets or roll-containers. We at Thermal Mark are absolutely delighted to have Framec on board. Their global reputation aligns with our mission to be the brand you can trust. With the addition of Framec’s world-class truck bodies to our range, Thermal Mark continue to cover all of your refrigerated transport needs. Discover the range of Framec refrigerated truck bodies here or call us on 1300 798 380 to speak to a member of the Thermal Mark team.